This item is also available with a leather grip. 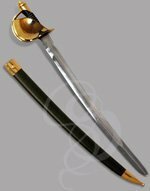 Please see our Brigantine Pirate Sword, Leather for details. Brigantines were swift, double-masted skirmishing ships that prowled the seas looking for trouble. Pirates loved these ships, but it was only a great pirate captain that could capture one and use it as his own. 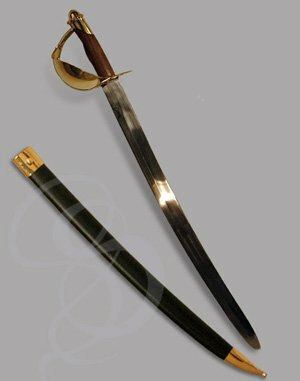 This backsword is what is typically refered to as a naval cutlass, and would have been used by pirates and privateers alike. The hand stitching on the grip and elegant bell guard would have made it a very expensive sword in its day and so it most likely would have been used by a captain or first mate. The spacious brass basket and compact curved blade made it ideal for ship-based combat. This reproduction is quite authentic, with real brass accessories including the bell guard and pommel. 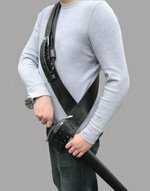 This sword is probably the lightest and most comfortable pirate sword that we carry. It's light enough to swing quickly and easily and just feels great in your hand. The hardwood grip is sturdy and very comfortable to hold and there is ample room inside the bell for good finger-work (or a small sandwich for those battles that just seem to last forever). The blade is a hand-forged high-carbon steel. A shallow fuller is carved into the blade, giving the sword a nice lightness to it that would have made it lethal on deck. Like most of our hand-made swords, each blade has a scabbard custom made for it, guaranteeing a great fit. The scabbard on this blade is made of wood and wrapped with leather. Brass accents at the throat and tip complement the sword and add a touch of Officer's class. We offer this sword in a tempered sharpen and an un-tempered sharpen. The main difference is that the tempered will hold the edge. Grip Double-stitched Leather over Wood. Arrrr you in the market for a cool sword, matey?! Pirate jokes aside, this is a beautiful weapon. I bought a few as gifts for my groomsman and I really admire the workmanship and finish, both on the brass and the wood on the sword, and even on the leather and brass on the scabbard. I am very pleased with the engraving too, though that's more of an assessment of Strongblade in general than this specific weapon; Roger was great about following up with me when I had a few questions about that.